Frank Gusenberg's gun is seen on the floor near the bodies. The killers disarmed the victims and apparently just tossed the guns onto the floor. The insert at lower left is the police form logging the gun as evidence. The top insert is a close-up of the gun. 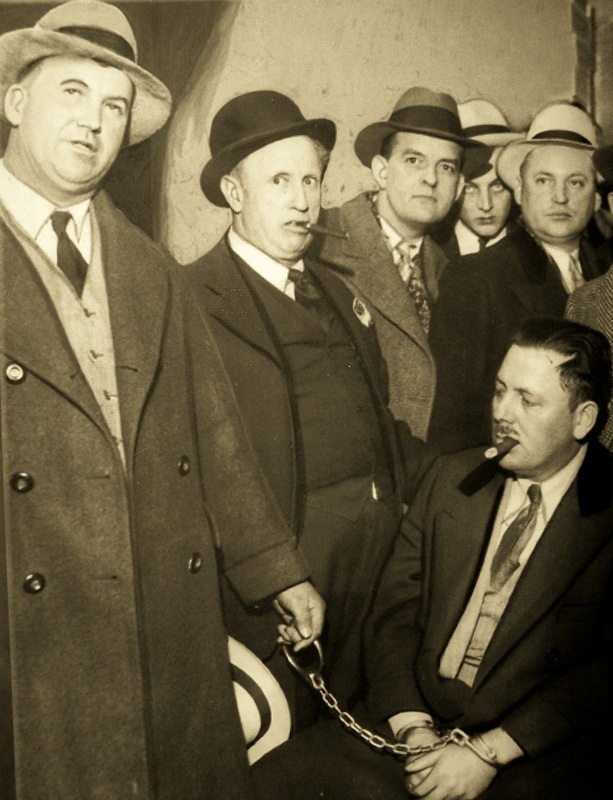 Chicago police named John Scalise and Albert Anselmi, above, and Jack McGurn, below left, and Capone bodyguard Frank Rio, lower right, as the killers. A week after the shooting, a 1927 Cadillac sedan was found disassembled and partially burned in a garage on Wood Street. It was determined that the car had been used by the killers. The garage was located two blocks from the Circus Cafe, which was operated by Claude Maddox, a former St. Louis gangster and now a member of the Capone organization. That connection led detectives to check leads in St. Louis in the belief that members of St. Louis’ Egan's Rats mob might have played a part in the killing. Based on vague information, police soon announced they were seeking Fred "Killer" Burke and James Ray as the two uniformed police officers in the garage since Burke and other members of the St. Louis mob had been known to use police uniforms to fool their victims in various crimes. 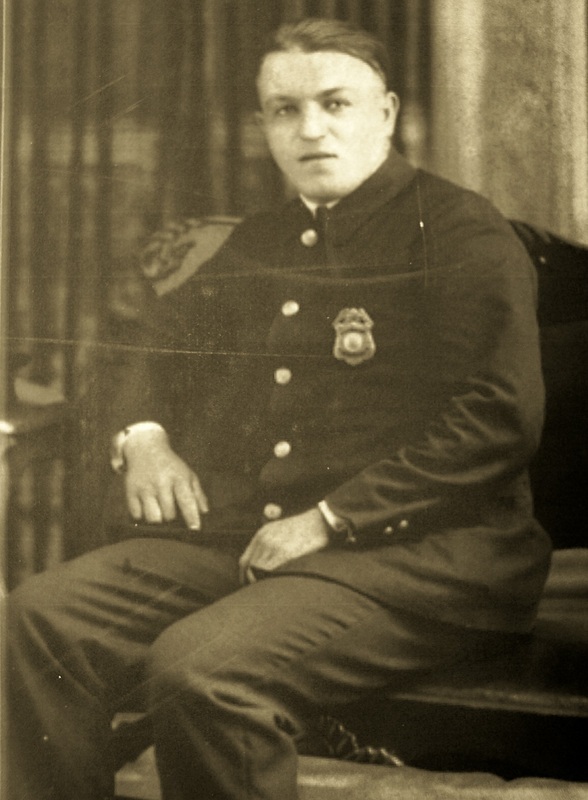 Police also proposed that Joseph Lolordo may have been one of the machine gunners, most likely because his brother, Pasqualino, had recently been murdered by the North Side Gang. 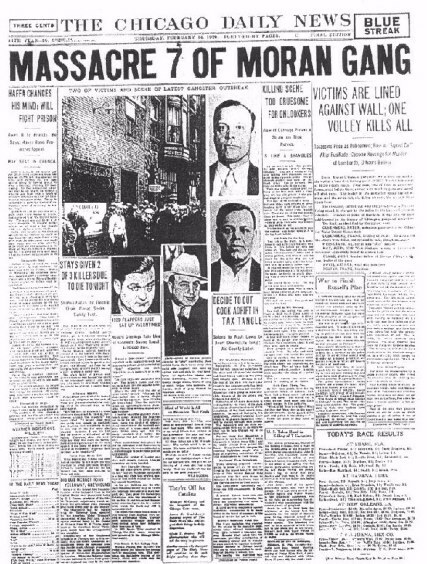 Closer to home, police also announced they suspected Capone gunmen John Scalise and Albert Anselmi, as well as Capone’s top gunman, Jack McGurn, and Capone bodyguard Frank Rio as the four shooters. Police eventually charged McGurn and Scalise with the shooting. However, Scalise was murdered before he went to trial and the charges against McGurn were downgraded to a violation of the Mann Act because McGurn had taken the main witness against him, girlfriend Louise Rolfe (who became known as the "Blonde Alibi"), across state lines to marry. Despite early movement in the investigation, it quickly stagnated until Dec. 14 when Berrien County sheriffs raided a St. Joseph, Mich., bungalow owned by a "Frederick Dane." Dane had also been the registered owner of a vehicle driven by Fred "Killer" Burke who had been drinking and rear-ended another vehicle in front of a police station that month. Officer Charles Skelly went outside to investigate and when Burke attempted to drive away, Skelly jumped on the running board but was shot off. He died of his wounds a short time later. Someone had seen the vehicle’s registration number, however, and that led police to "Dane’s" house. 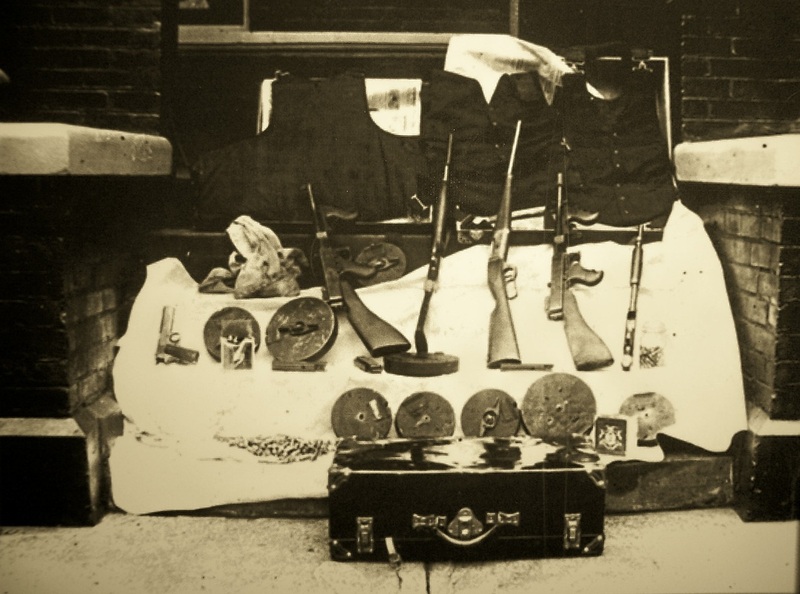 When police raided "Dane’s" bungalow, they found a bulletproof vest, bonds recently stolen from a Wisconsin bank, two Thompson submachine guns, pistols, two shotguns and thousands of rounds of ammunition. Both machine guns were determined to have been used in the massacre. That was the only concrete evidence that would ever surface in the case and no further arrests were made. Burke would eventually be captured more than a year later on a Missouri farm. But as the case against him in the murder of Skelly was stronger than the circumstantial evidence against him in the massacre, he was tried in Michigan on the Skelly killing. He was found guilty and sentenced to life imprisonment. He died in prison in 1940. 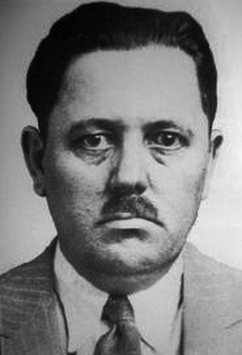 Officer Charles Skelly is pictured above. At right, Burke is taken in after his capture. 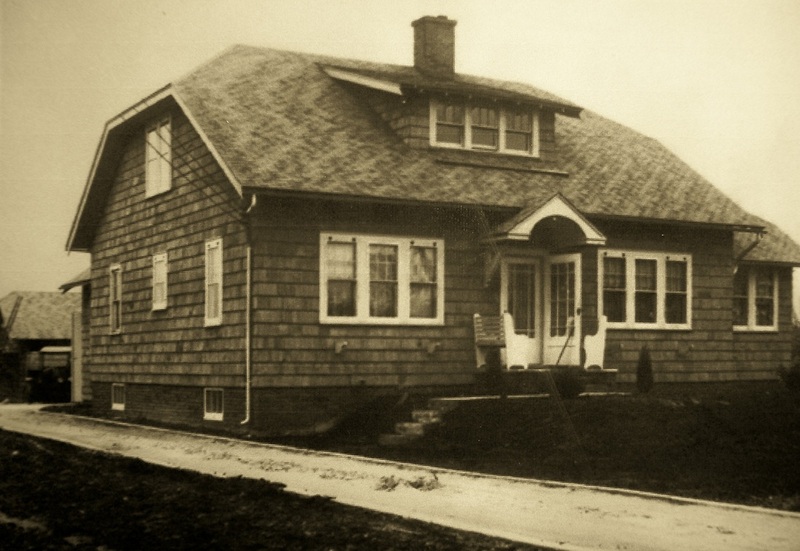 Below left is Burke's home (listed under Frederick Dane). At lower right are the weapons found in the home.